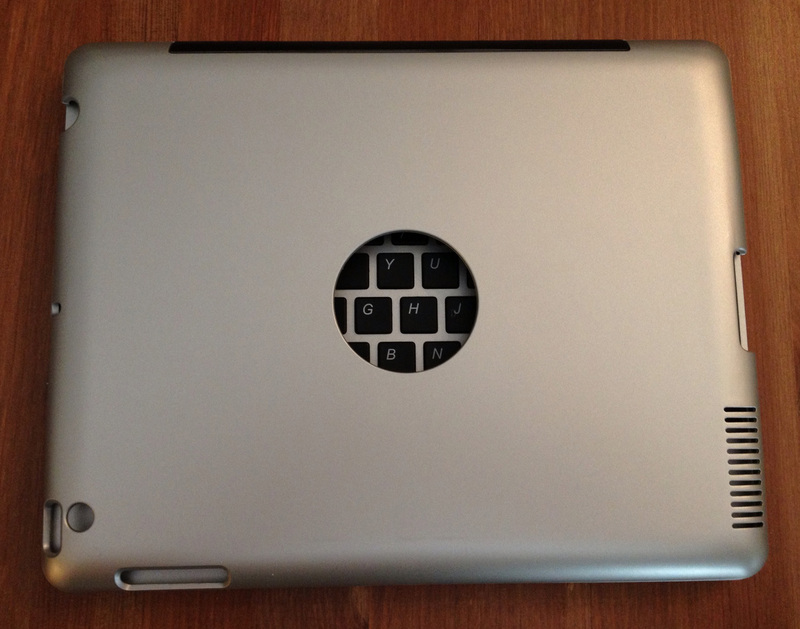 An iPad keyboard case shaped like a MacBook “clamshell” might just be the holy grail of iPad accessories. A Kickstarter campaign last year famously made this idea a reality. 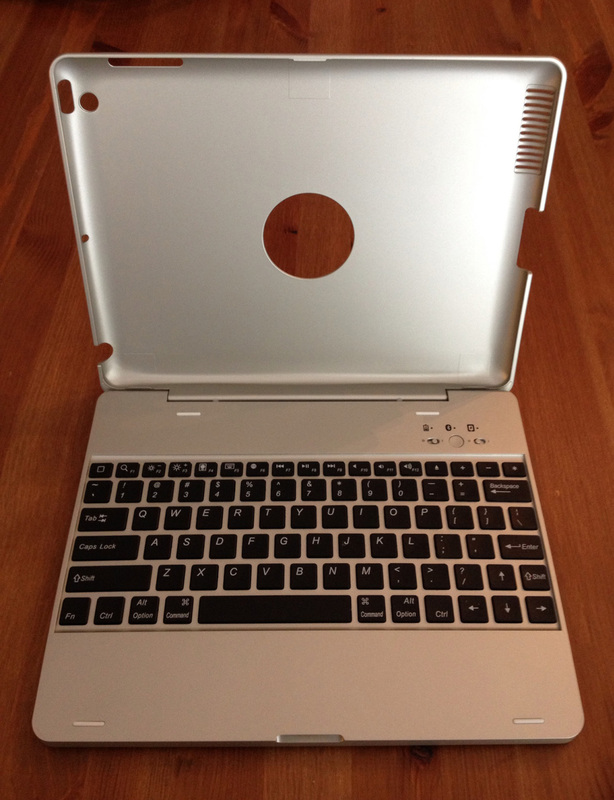 Since then, MacBook clamshell cases have popped up in the catalogs of several accessory makers. I’ve been itching to try out one of these cases for eons, so this Bluetooth Keyboard Case, for sale exclusively at MobileFun.com is my first. Just how much would one of these class of iPad cases feel like using a MacBook? 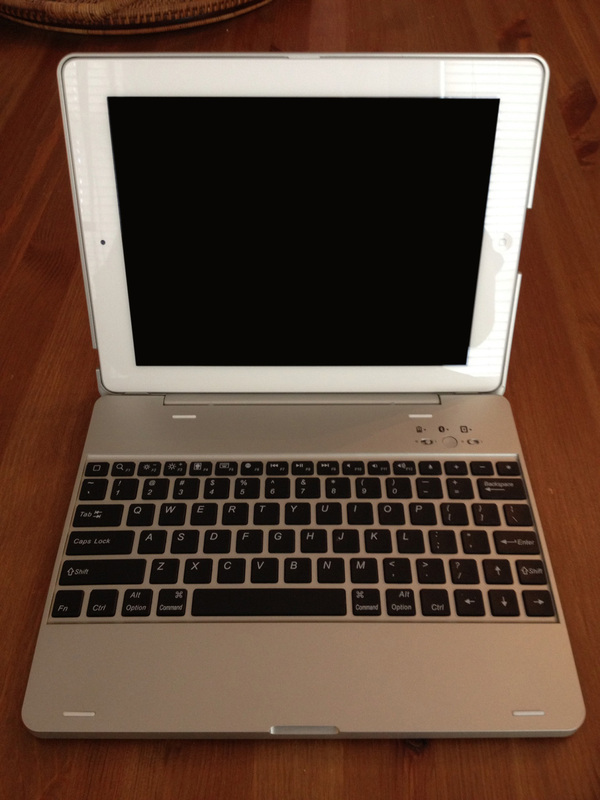 Can working on an iPad (with the help of a clamshell case) compare to working on a laptop? Well, the experience will vary of course from one case to another, but regarding this Bluetooth Keyboard Case… The answer is yes. And no. At first glance, it looks like it’s made of Apple’s same kind of brushed metal. But it’s really a clever disguise. The Bluetooth Case is actually made of a lightweight, but rather hard plastic. This carries both positives and negatives. In the minus column, it feels and behaves like inexpensive plastic, so it’s just as susceptible to scrapes, scratches, and dents as your standard Tupperware bowl. On the plus side, plastic weighs considerably less than metal, so the case adds very little weight to your iPad. It’s nice and slim, too, so it lends itself to portability very well. On the other hand, it’s such a featherweight that every time I pop my iPad into the top half, the whole thing feels top-heavy when opened. I half expect the iPad’s heft to make the whole thing fall backwards, but somehow it stays up. Inserting an iPad is easy: there are three tabs along the rim of the shell — two at the bottom and one at the top — that hold it in place after you pop it in. Closing the shell (the same way you’d close your laptop) puts your iPad to sleep, just like a Smart Cover does. The keys aren’t quite as fluid and springy as the Apple keyboards I’m used to, but they get the job done very well. They’re spaced apart with some nice breathing room in between, not rubbing up against each other like the keys found on standard portable keyboards. The result is a much better experience than you’d expect, feeling more like typing on a computer or a laptop than a keyboard case. The keyboard comes with iPad-specific keys that double as the function keys at the top of the keyboard. They include a Home button, search, brightness controls, virtual keyboard activate or hide, playback controls, volume, a power button, arrow buttons, and even a button that activates your slideshow/digital photo frame with a single press. The keys are sunk a good two or three millimeters into the keyboard’s plastic surface to keep them from rubbing against your iPad screen when it’s closed. The problem I experienced was that when pressing the keys on the outer perimeter, my fingers would touch the plastic frame and even be stopped by it at times. So when pressing the space bar, for example, my thumb kept accidentally hitting the frame more than the key. And for the $57 price, I expected the keys to be backlit. (They’re not.) 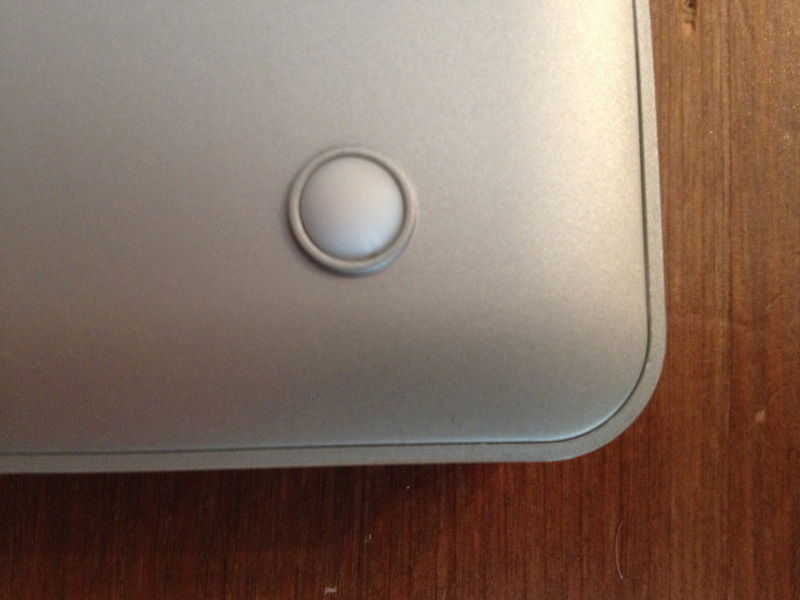 Four rubber dots on the case’s underside give it some nice friction, holding it in place on most surfaces. There’s no escaping the fact that having an iPad case that’s shaped like a MacBook is just cool. It feels so much like a laptop that I kept finding myself trying to use its nonexistent trackpad. 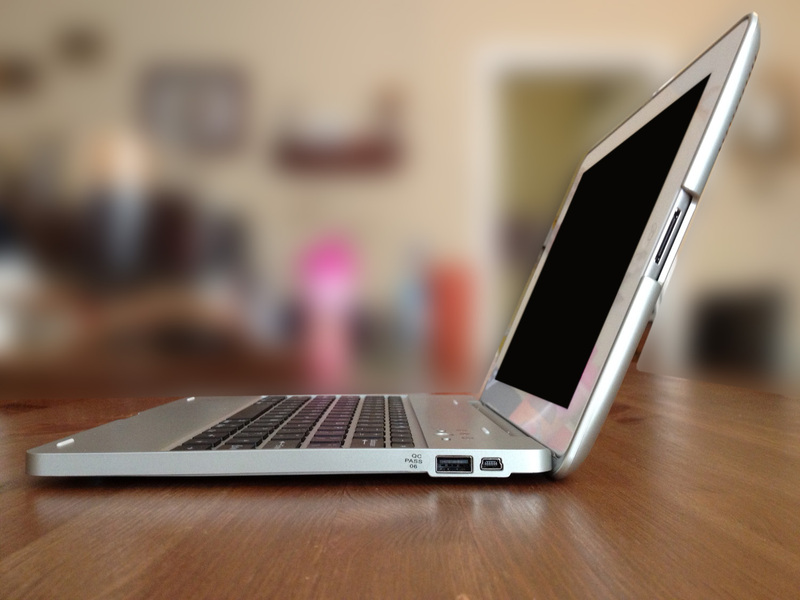 A lot of care and attention was put into mimicking the appearance of a MacBook. Even if it is made of plastic, it’s got all the little recognizable touches that you see on MacBooks: the notch at the front/center that helps you separate the magnets to open it, a black hinge at the back of the shell, the rounded rectangle shapes, the black keys, etc. That said, the aforementioned notch doesn’t work exactly like a MacBook’s does because of the weight issue. The Bluetooth Keyboard Case’s weight distribution isn’t calibrated the way Apple makes its MacBooks. I can open my MacBook Pro with one finger by lifting the top half, and the bottom is solid enough that it always remains firmly in place. Trying that with the Keyboard Case just lifts the entire thing — iPad and case — up off the surface it’s resting on. It’s a small issue; it doesn’t take a lot of effort to use two hands to hold down the bottom while lifting the top. 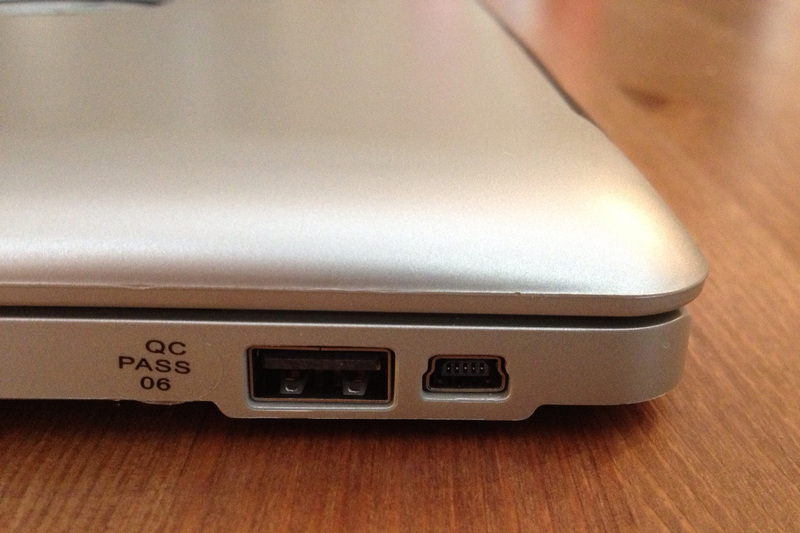 But I never noticed the convenient, one-fingered way I can open my MacBook until now. The top half of the plastic shell has holes cut out in all the right spots so you maintain full access to your iPad’s volume controls, power button, speaker, charging port, camera lens, etc. 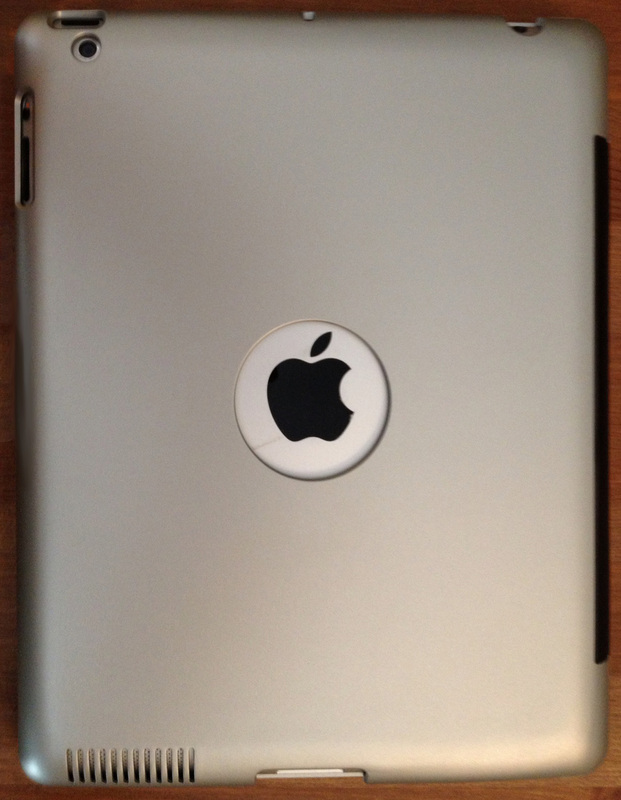 One detail I especially like is that while the shell has a full back (unlike the Brydge, which has just a pair of slots to slide your iPad into), there’s a small round hole right in the center allowing the black Apple logo on the back of your iPad to remain visible. It’s not the kind of thing that everyone will care about, but for those who like to proudly display their Apple devotion, it’s a thoughtful touch. I had a few other minor issues with the case. For one thing, the “stand” function doesn’t give you much in the way of adjustability. You can push the clamshell top back maybe ten degrees beyond vertical, but if that doesn’t suit your line of sight or there’s a glare on your screen, you’re just out of luck. It’s not going to bend back any further than that. Most of the little issues I encountered are forgivable simply because it’s so cool to be using a case that (kinda sorta) turns your iPad into a MacBook. The one problem I can’t quite get past is that the thing just doesn’t hold a candle to the level of machining and engineering mastery that Apple puts into its designs. Apple’s products are ridiculously solid, like slabs of metal with technology injected inside. This thing feels insubstantial. Flimsy even. I put it through some strenuous use and it never fell apart on me, but a seam is clearly visible around the underside of the keyboard, and several times it felt like the seam was going to pop and the innards spill out. It never happened, thankfully, but there’s actually a warning sticker on the bottom of the case that says not to “drop or open” the thing. So you’d think they would have made it a little harder to do that second one. A pocketknife wedged into that seam would pop it open very easily. The Bluetooth Keyboard Case isn’t the sturdiest accessory ever, but it has a lot going for it and there’s no doubt it will turn heads when you use it in public. 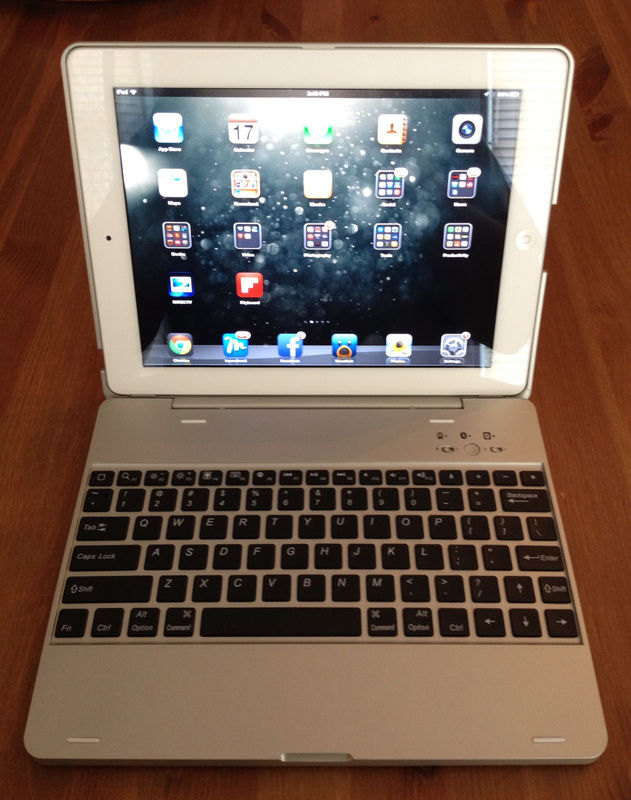 I find that some clamshell style keyboard cases add too much bulk to the iPad. Compromises portability etc. I much prefer the folio style as it is usually much thinner.